There are shares, there are tracks, but it is quite different of the game you possibly think of now. 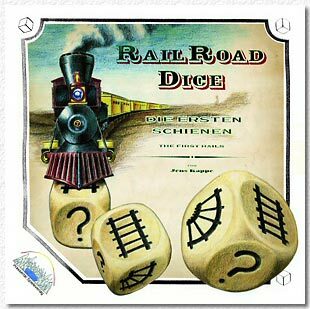 In Rail Road Dice, you roll a number of dice when it's your turn. Those dice have straight tracks, curves, buy-a-share or question marks (which are wild) as sides. Even if you happen to roll six dice you can be unlucky enough to not roll a single straight line. Or perhaps there are no options to buy stocks. In short: You cannot plan your turn until the die is cast. You don't get anything at all for shares if you do not have the majority. Therefore, if you do not have the majority, there is no reason to be interested in that particular line. You can dispend of watching another player playing it. Poor Hans. He tried to be director of two lines. He lost both. It is okay that a game does not reward failure. But it is not acceptable that Hans was confined to a mere spectator role. This sounds boring? Oh yes indeed, it is. 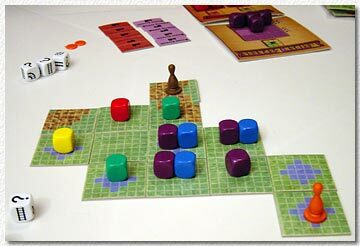 Rail Road Dice is something of solo-player game played with four players, and not a good one. 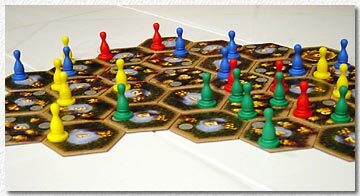 Günther proposed that it might be better with 2 players. I am not that sure. In any case, we stopped it after 2 hours. Verdict: Poor game play. I am sure that no-one (except Günther) would be ready to give it another try. This is quite an abstract game. 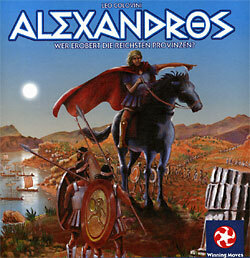 In your turn, first you move Alexander the Great: You gain a card if you move him with one of the two open cards. You lose a card if you move him with one card of your hand. Besides this stoic way of movement (let destiny have its will - if you rebel, you'll only pay with your cards), players dispute areas. Those areas give, surprisingly enough, victory points. When it's your turn, you have two actions. One of them could be counting victory points. Thus, most players avoid counting points except they are the top scorer. 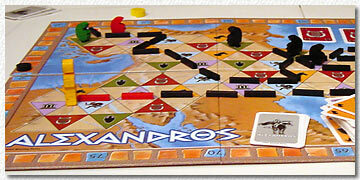 On the other hand, the leading player will score every turn and accordingly lose one of his two actions. This is a nice game mechanism, or so it seems. But there is a problem: Imagine a coup which would give you temporarily ascendance over an area. However, there is no point in scoring since the top player would profit more than you do. The top player, on the other hand, can do those coups with his first action and score with the second. In our game, I got an exceedingly large area by chance (well, it just had the right cards in hand). I never lost it, and it gave me every round 15 v.p. (plus those I got for lesser areas). One reason why no-one could dispute it was that there weren't 11 cards of each type as the rules state but 21 of one single type. Unfortunately, we did not notice that during the game (but we did notice all those stupid blue warrior cards and counted the pile afterwards). So I had my area and everyone else had lots of blue warrior cards. The game was far from being thrilling, and my victory was undisputed. We did like the mechanics, even if we are not totally convinced that they run smooth. We'll surely play it again, with 11 cards of each type. (If you happen to own the game, please count your cards and post in our forum whether this was singular faulty game or they sold lots of copies with too many blue cards). Verdict: Intelligent mechanics. Not sure if they really work out. Need to play again. Ratings are therefore tentative. This game does not only share the name of the best music CD burning software but even the exclamation mark as part of the name. Let's hope it's okay with Jens Fangmeier. Feurio! the game is a quick game with a huge luck element, so perfectly suited for finishing the evening. However, I have got several objections: For the final scoring, your v.p.s get divided by a divisor. Now, from time to time, you can get a very bad (I lost my 1 and suddenly had 6 - ouch!). This introduces lots of king maker scenarios. At the same time, as soon as it is clear that you can't get rid of your bad divisor (as happened to Hans), this game is over for you. I did win, but only because Loredana and Günther did not notice that I could get back my 1 divisor. If they had noticed, they would have thwarted it but would have lost the chance to something good for themselves - i.e., either of the others, Günther or Loredana, would possibly have won. 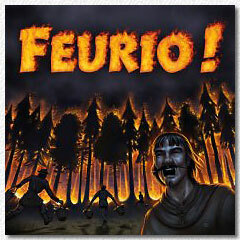 Feurio! is a nice game, but I do not cherish those types of decisions and I shall prefer others games to end an evening of board gaming. Verdict: Nice quick game. Lots of luck involved but that's okay because it is short.